About time I finished this series of posts from our NYC Vacation… Will be covering the last 4 plays, the museums, and the restaurants we visited. If you haven’t already, check out the first and second posts about our vacation. This play won the Pulitzer Price for drama and received three 2017 Tony Award Nominations. It was one of the best plays we’ve seen in the past few years. Very involving, moving, and relevant to today. It takes place in Reading, PA, a factory town and covers many subjects – friendship, race, drugs, factory layoffs & closings, rage, and the aftermath of all of these poured into one town / group / emotional community. It’s not a play that you quickly forget. In fact, writing about it now is making me feel back into the place and thoughts that I had at the time. The play gives you a look inside a town and its people and you watch as they lose their jobs, livelihoods, friends, and futures. And you feel, as do they, helpless to do anything to turn things around. It’s been happening all over this country for the past 2 decades in various ways while most of the people in government and industry keep telling people to pick themselves and move on. But there isn’t any way or place to move on to… The play has closed on Broadway because of not breaking even in its sales – too bad as it is quite an enlightening play. The short video below is from the Oregon Shakespeare’s production of Sweat on its way to Broadway. Present Laughter is a comedy/drama by Noel Coward that made its premiere in 1939/1942 in a much different time and world – during WWII. The website for the play perfectly describes the play – “Present Laughter follows a self-obsessed actor in the midst of a mid-life crisis. 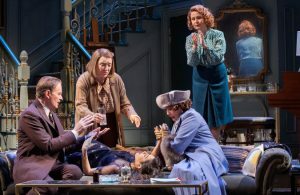 Juggling his considerable talent, ego and libido, the theater’s favorite leading man suddenly finds himself caught between fawning ingenues, crazed playwrights, secret trysts and unexpected twists.” Kevin Kline played the actor brilliantly and the rest of the cast admirably supported him. Noel Coward based the part on himself and played it himself in London. It made for a very funny and yet also poignant evening as we all get older and realize that those people and things that we found so interesting when we were 20-30 years younger are no longer interesting or important in our current place in life. Coward’s plays have often been downplayed as being fluff but I have always found them to be good social commentary on life and the world even if they are a bit sugar-coated. There is a reason why his plays keep getting revivals – they are enjoyably funny and serious at the same time. This play has also closed. 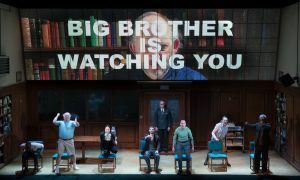 This play is based on George Orwell’s novel (which we all had to read in my high school English class) of the same name and has become synonymous with the creation of the terms “Big Brother” and “alternative facts”. Again, this play is very applicable to our current lives as well as being very scary. I’m not going to give you a summary of the play or the book it came from – you can check it out for yourself here on Wikipedia. All I can say is that it’s a bit harrowing and comes with a warning: This production contains flashing lights, strobe effects, loud noises, gunshots, smoking, and graphic depictions of violence and torture. It is not suitable for children under 13. Tom Sturridge, Reid Burney, and Olivia Wilde star in the current production which has had many productions in London and the US since it’s adaptation in 2014. This is it’s first Broadway production. It is quite a thrill ride and is actually based on the appendix of the book titled “The Principles of Newspeak” and not on the main part of the text. Orwell felt that the appendix was an integral part of his creation and would not allow any printing of the book without the appendix included. If you never read 1984 or don’t remember it I suggest that you get a copy and read it – it’s quite enlightening in our current times. MOMA is in the midst of another remodel and so every time we went the ticket desk was in a different place but the museum itself was not affected. 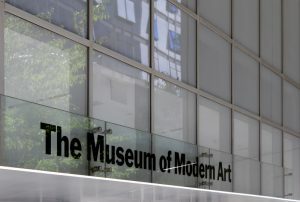 It is one of the best museums in the world and is well-respected by the entire art community. We must have spent the equivalent of about 6 full days there during this last trip. They had a Robert Rauschenberg exhibit that had just opened and Making Space: Women Artists and Postwar Abstraction (all pieces from their own collection). Both exhibits were wonderful and we went through multiple times. I especially enjoyed the later exhibit because there is so little available to see of art by women in any museum anywhere in the world and this was a good sampling of many well known women. We also spent quite a bit of time going through the permanent collection galleries which can only show a small portion of their collection at a time. Some pieces you can see over and over and never get sick of seeing, particularly (for me) anything by Mark Rothko, Henri Matisse, Pablo Picasso, Edward Hopper, Piet Mondrian, Cezanne, Monet, there are so many others as well… And they have a wonderful app that you can download and use as a guide as you go through the different exhibits and rooms. There is a lot more information on their website as well. It also had a wonderful user guide that you could rent and it not only had descriptions of the different pieces but many were recorded by the artists themselves which gave it additional meaning and helped with understanding what they were trying to say and why. There was a top floor that had more early/mid-20th century pieces from well-known and some little known artists that was also eye-opening. I always enjoy seeing and getting exposed to artists new to me whether they are modern/current or not. 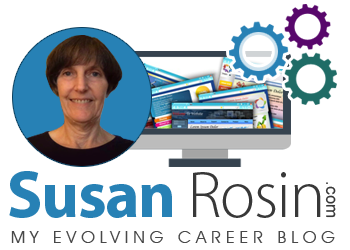 You can learn more about their exhibits at their website. Here is a link to the first of their videos about the Biennial. We visited the Jewish Museum up on 92nd St & 5th Ave three times to see the temporary exhibits that they had. Their permanent collection was not open but should be soon. Florine Stettheimer: Painting Poetry was a wonderful exhibit of paintings, drawings, and video of an opera she worked on. The Museum description is: Through over 50 paintings and drawings, this exhibition offers an important survey of the work of the modernist painter, designer, and poet Florine Stettheimer. We have seen other exhibits of her work but this was one of the first we’ve seen which gave so much information about her life, interests, friends, poetry and painting. The opera video was especially enlightening as it was such a forwarding looking, collaborative piece which there is very little information about. She was a very wonderful artist and poet who got so little attention from the art establishment simply because she was a woman and a self-sufficient one at that. It is interesting how many male artists recognized her talent even though the buyers, agents, and other parts of the art world wrote her off as being just a society amateur. The Arcades: Contemporary Art and Walter Benjamin was interesting because of Benjamin himself, his Arcades Project which was about the Arcades of Paris (smaller forerunners to our modern shopping malls) and the artists who agreed to participate and react to his writings. Here is a link to The Jewish Museum’s blog and podcast that gives more info about the exhibit than I can do justice to. Let’s finish this part off with saying that we both found it very interesting, inspiring, and worth the time that it took to go through it all. Every time I read or see anything by or about Walter Benjamin I am overcome with sadness and regret that his life was shorter than needed because of WWII and Hitler’s campaign against the Jews (and many other groups as well). There was also a one room exhibit by Charlemagne Palestine that was called Charlemagne Palestine’s Bear Mitzvah in Meshugahland. The room was full of Teddy Bears and other things. Charlemagne liked the story of the creation of Teddy Bears – The first bear was hand sewn by Morris and Rose Michtom as a tribute to President Theodore Roosevelt following his much publicized hunting trip during which he refused to shoot a bear cub that had been readied for his aim. The incident was popularized by the prominent illustrator Clifford Berryman’s cartoons in the Washington Post. The Michtoms, along with the rest of America, became fascinated by the story and thus dubbed the newly invented toy “Teddy’s bear.” (from the Museum website). Go to the Jewish Museum’s website to see pictures and the full description of the exhibit. What can one say about the Met that hasn’t already been said? It is such an amazing amalgam of modern art, antiquities, and everything in between. There was a very interesting centennial exhibit of Irving Penn’s photos. Neither of us were familiar with Irving Penn but we did recognize his photos once we got into the exhibit. He took the most amazing fashion photos and worked for Vogue for many, many decades. While he was doing that he also was taking pictures of still lifes; Quechua children in Cuzco, Peru; portraits of urban laborers; female nudes; tribesmen in New Guinea; and color flower studies (from the museum’s website). All of his photos were wonderful and his eye for composition and light very impressive. Not going to go into much detail about where we ate just wanted to mention a few of our favorites: Bareburger – we ate here many times and loved the food. Besides tasting great and having a good selection of not only food but beer as well we loved that everything they serve (except the beer) is organic. Organic food is a high preference for us and that’s why we visited at least 3 different Bareburger locations in NYC. Their turkey burgers, chicken breast, and beef burgers were delicious as well as their side of Brussel sprouts which we always ordered. And their prices are reasonable too! Ippudo – one of our favorite restaurants. Love their ramen, their Brooklyn Lager, and their incredible selection of sake and whiskey. We are really excited because they are opening an Ippudo restaurant in Berkeley this week and another in San Francisco soon. Can’t wait to be able to go there the next time we go to Berkeley!! Pret a Manger – This is a British chain that opened in NYC a number of years ago. We have always found it a quick, easy, and reasonable place to go for lunch or dinner. We started also going there for coffee this time as the coffee in the hotel was not very good (not to mention they ran out quite often) and the coffee at Pret is a lighter roast and organic – we’re there!! Our trip is over, my memories are already starting to fade so I am finishing up this 3-blog series and I will do it again the next time we go on vacation somewhere. Hope you all enjoyed it!! Leave me a comment below and tell me where you like to go when you are in New York!